I always visit my motherland. Everyday I speak great of this country, I boast of this country but what have this country offered me and its citizens? Yes! Every country have its own flaws but when the citizens complains but they are not heard then that country seem to be the worst……..Nigeria! The country I speak well of, full of riches and wonderful people yet they are smiling and suffering. Thank God I can afford to buy fuel for my generator despite the noise**eye rolling** but what about those that can’t, no light, no fuel yet the people live like its nothing. Someone said ” what can we do na? We are use to it” really? Why do we get use to some things that doesn’t bring joy n peace to life? The basic needs of life Nigeria can’t offer except you are rich and able. …..One evening, I took a walk to go get fuel with gallon, wanted 1k fuel but was given 950 naira fuel, why I asked, he said “you have to pay for the gallon, that’s how its done”, what? I said, who said and where is it written? Every body was looking at me like a fool and stranger, I insisted, and asked for the manager, guess what? We didn’t ask the electricity to be off, we paid for it, so we should have what we paid for. Fuel stations have no reason to take money away cos people are buying with gallons. Oh Nigeria!, land where different countries run to for oil and gas. 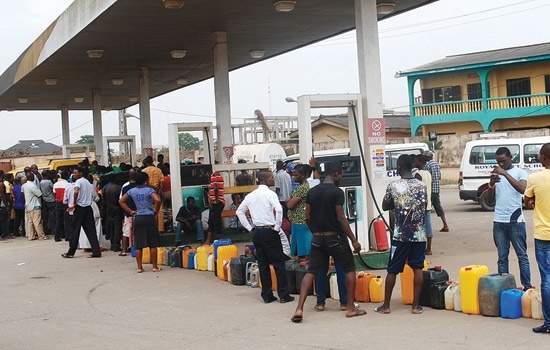 …..Another incident happened when I went to a fuel station, people were lamenting, lots of them wt gallons, car parked, wasting time and energy yet nothing was done, no fuel they said. I walked up to the fuel guy, of course well dressed, sun glasses on, nice car, spoke well, I asked for fuel, he refused, 2mins later he asked that I wait he will attend to me, 10mins later, my car was fuelled, I was hailed, called “mama” madam”, fine woman”. I smiled and gave him 200 naira for a drink, what is 200naira for cyring out loud. I was not too happy bcos in a way I just bribed him, that’s how I felt..…..oh boi, what happens to the poor citizens, who have no money to give, who do not dress to impress, who do not know any one to call. My country Nigeria why? ……Every bad thing seem normal to people here, boko killing is nothing, ppl wake up n decide to take another life, after all, they did yesterday and no one did anything so they will do it again. These are not outsiders, they are Nigerians, yet we are called one nation, one Nigeria, hell to the NO. …..People tell me, there’s money in this country ooo, yes there is but where is it? To make this money, you have to not beat them rather join them, u have to have a strong, corrupt, and no mind/conscience, one have to know some all and mighty people, one have to have connections as they say. Few, just make their money from their sweat and struggles. Many make money by Gods intervention and favour. It’s a pity! Very sad. Where is the hope? what’s the future for our kids? Youths are on the streets, no job, no hope, graduates are crying for help, girls are turning to prostitutes just to make it. When a girl sleeps with a married man for money, a senator for money, a guy for money, jumping from one man to another, are you any different from a prostitute? ….Who do we turn to? Is this country forgotten? Why are humans so wicked? God where areyou? What’s the way forward Nigeria? EGO’S QUESTION TO FELLOW NIGERIANS: What are we waiting for? Are we all going to cross our hands and watch? Whenever I visit home, I don’t bow down to bribery or keep quiet to corruption. I nearly got killed in Abuja by a military officer who accused me of standing on the platform where his boss stands during morning assembly *holy smokes* I didn’t even know the ground I was standing was their assembly place. I got really upset and asked him if his boss was GOD? He charged like a bull dog and raised his gun. My driver jumped in and begged him with all his strength, then turned to me and said “Do you want to die for nothing??? It was a shocking experience for me and lots of other bad experiences. However, when I returned to Lagos all that Abuja bad experiences where erased from my brain cos I had good fun from happy people!!! This entry was posted in News, Politics and tagged egosentrik photo of the day. HMmm na wa oo. Wat do we do nah? Who will want 2 die 4 notin? like ur driver said?my we are use 2 it oo, jst like d writer…. Only God can intervain.